For the last 8months I’ve been getting to watch a lot of an old 1960s soap opera called “Dark Shadows”, about a vampire and his family. The series started in 1966 and lasted into the 70s. There was even a remake of the series in the 1990s. And now, Tim Burton is doing a movie based on this series. I’m really excited about the movie, and trying to watch as much as I can of the original series. October always seems to be the month to release horror stories on both the big screen and the small screen. Last year, Walking Dead was released to AMC and devastated the competition, becoming a very successful television series for last year and being highly anticipated for this year. Another highly anticipated television series is The American Horror Story on the FX Network. When I saw the first trailer for this television series, my interest was peaked. I’m all about paranormal phenomena, haunted houses, and the story of the people dealing with the strangeness. I was eagerly awaiting the new show, with high hopes. Fortunately, those hopes were not completely dashed. Ever want to go to a live taping of a talk show? Well for me, I’ve thought about it a few times, though it’s not one of those things I’ve ever gone out of my way to do. I would if it included Ninja Turtles, but I never had that chance as they were always out of state back in the day when the Turtles did appear on shows such as Oprah. 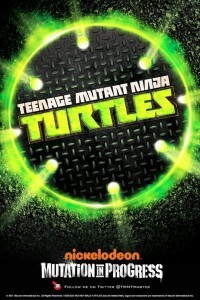 More news is being released about the new TMNT cartoon that we’re going to be waiting a year to see hit TV. Today, all four Turtles voice actor names have been released to the public and the excitement grows in the crowds. Though everyone is going to react differently towards the news with one thing for certain, we’re going to be sitting at the edges of our seats to hear what they’re going to do for the voices. Read more about TMNT 2012 Voice Actors! With TMNT having down time as we watch every piece of news coming out from Nickelodeon and IDW for something new, it’s good to see spoofs of the Turtles on the air to give us all something to enjoy. Recently on Cartoon Network their Mad TV cartoon did it’s own spoof on TMNT mixed with TMZ, calling it TMNTMZ TV. In the last week Turtle fans have been hit with a lot of news a select group of fans was chosen to go to Nickelodeon to have a sneak peek at the Mutation in Progress itself. They were treated with hotel, food and even gifts from Nickelodeon. These lucky people got to share their feedback on what they thought of the things that were shown to them. Now, some of them are sharing their stories with the rest of the fans. "Spider Baby", the Original "Little Shop of Horror", and "King Kong Escapes" all have something in common these days. Night time Horror Host Shows. Usually on Friday or Saturday night you can find some TV show with a creepy host showing bad old movies, making fun of them and doing their own things in between the clips of the movie. In July 2007 a new face came to the world of Horror Host, Wolfman Mac. Recently I was introduced to an anime named “Soul Eater”, about children that are being trained by Death to be warriors. From the beginning it is clear that this world isn’t Earth. It’s a fun world of magic and warriors. One of the things that pulled me into this series was their way of handling this darker side of life, giving it the light twist of insanity. You could see this from the beginning of the series with the faces upon the Sun and the Moon. I’ve always enjoyed that bit of twist to the darkness. Much like Halloween Town in “Nightmare Before Christmas”, this town had that feeling that these dangerous things were only out there to live and do their job, while having fun. Read more about Review Corner: "Soul Eater"
My expectations were high for this new television series. I never like getting my expectations up too high, just because I’ve been so disappointed in the past. But, I knew the comic it is based off of is good, I knew the director is pretty darn amazing, and what I have seen of the makeup for the zombies was impressive. It was difficult not to have high expectations. Thankfully, my expectations have been met and pretty much exceeded.